There's no shortage of great running watches on the market, but now big brands such as Garmin, TomTom and Fitbit are adding optical heart rate tracking to the wrist, it's not so easy to choose the right one for you. 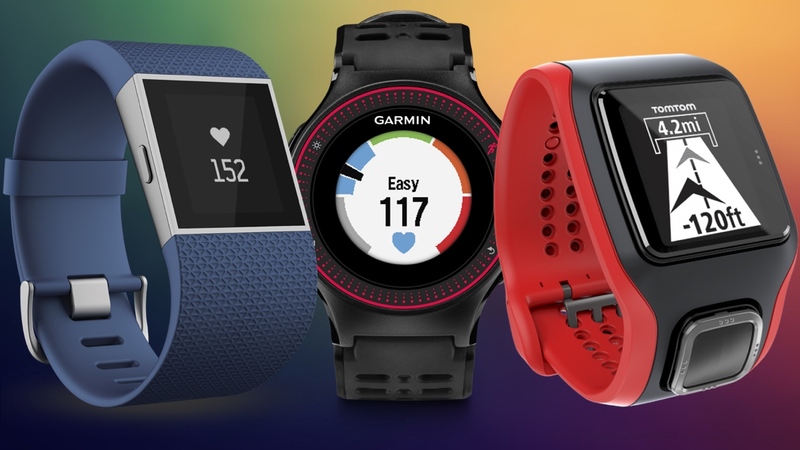 We've tested a range of GPS-enabled running watches over the last few months and have decided to pit three of our favourites – the Garmin Forerunner 225, the TomTom Cardio Multisport and the Fitbit Surge – against each other for a showdown. The Garmin Forerunner 225 has a very familiar feel to it, retaining a lot of the family DNA. It's the same round face from the 220 and 620, the same colour LCD display (no touchscreen though) and has the same button controls. At 16mm thick, it's noticeably chunkier than its closest relatives – the added bulk coming as a result of the inclusion of an optical heart rate sensor, which we'll come back to in a bit. Ruggedness is vital in a good running watch and the 225 handles the knocks of everyday usage with ease. Wheras the TomTom Cardio Multisport eschew buttons in favour of a central joystick control, and the Surge only has two buttons; there are five buttons on the 225, which does require a little getting used to. The TomTom Cardio Multisport is the follow up to one of the most promising running watches of last year – the TomTom Multisport –but is almost completely redesigned with an added optical heart rate sensor thrown into the mix. The strap is much more comfortable to wear for longer periods, while the watch face now stays in place, a considerable improvement on the previous model that was prone to coming apart in a gym bag with little provocation. The Surge shuns the traditional activity tracker band form factor and is definitely more smartwatch than fitness tracker, but is somewhat put to shame by its rivals when it comes to aesthetics. The Fitbit Surge's rubber strap is both comfy and secure, but it's hard to look past that dated looking display and the increase in girth from the modules bottom to top end is rather bizarre. The display is a rather drab looking touchscreen monochrome 1.25-inch LCD number that uses a plethora of greyish blue variants for its different homescreens and menus. The Fitbit Surge is capable of tracking steps, distance, calories, floors climbed, elevation and active minutes thanks to its 3-axis accelerometer, a 3-axis gyroscope and digital compass. It's easy to select the type of run you want to track with the Surge: free, lap or treadmill. The first one is the one you'll use most, the second allows you to press a button to record lap times and the third is a non-GPS option that uses the step algorithm to track your gym jogs. The TomTom Cardio Multisport Running Training mode has six settings: Free Run, Goals, Intervals, Laps, Zones and Race. In Zones, you can select Pace or Heart. Pace can be set with a minimum and maximum to the second. Clearly aimed at triathletes, it boasts easy-to-use interval training setups for both pool work and running - sadly bpm tracking doesn't work in the pool. Cycling accessories like cadence, power and speed sensors can be paired via Bluetooth Smart to add professional-levels of data on two wheels. Garmin has crammed some of the best features from its existing running and fitness range into the 225. On top of GPS, you'll also find activity and sleep tracking, making this a much more capable all-rounder. The Forerunner 225 will automatically adjust your daily steps goal based on your recent activity and you can also set the watch to give you a gentle vibrating reminder if you've been stationery for too long. The on-board accelerometer that makes the activity tracking possible, also lets you track your indoor runs, should you need to take to the treadmill. Garmin and TomTom have both paired up with heart rate sensor specialist Mio for its optical recording – the same sensor is found in both the 225 and the Multisport. Fitbit has gone it alone with for its OHR, with its own PurePulse technology built in. On the 225 there are five heart rate zones: Active Recover, Aerobic Threshold, Tempo, Sub Lactate Threshold and Lactate Anaerobic Threshold; with time or distances parameters for an infinitely personalised training session. There are also designed off-the-shelf bpm training packages that can be tailored to your needs. On the TomTom, Heart rate zones come with a range of pre-set functions: Speed, Endure, Fat Burn and Easy. You can also choose custom zones where a minimum and maximum rate can be set. The watch vibrates on the wrist differently depending on whether you're over or under your pace or heart rate. At the same time, an arrow appears on the screen. On the Surge, basic heart rate tracking during activities is on offer, and you can also monitor your resting heart rate everyday, allowing you to track it over time and see what events in your life cause it to fluctuate. Combined with the company's algorithms, you'll be able to get a more accurate calorie burn figure and keep a closer eye on your health. The Forerunner 225 works alongside the recently renovated Garmin Connect online platform and smartphone apps to let you do a vast range of things like create and manage training plans, get more hands on with your post run data, connect with other runners via the Garmin community, earn badges or pool your data from other Garmin tracking devices into one destination. The simple to use TomTom app will display your most recent stats, while simultaneously uploading all the data to your TomTom MySports site. The web tools are easy to navigate and nice and clear for those who want the more accessible top line data from their runs. However, if you're after detailed analytics of the sort you get from Garmin, you'll probably be disappointed. The Fitbit app lets you see your step count, your current heart rate, the distance you've covered, calories burned, floors climbed, active minutes and also lists all your workouts. From within each of these you can select to see more info and be presented with a plethora of graphs and historical date (daily, weekly, monthly). It also allows you to record extra workouts, share and compete with your friends, log your food intake and earn badges based on your activity achievements. On Fitbit's website it states that the battery life is both "up to 5 days" and "7+ days". We got just over three full days out of it, but that did include an hour or so a day of GPS based activity. The Surge carries a water resistant rating of 5ATM. In terms of smartphones notifications you're looking at incoming call alerts, missed calls and text messages. It can, of course, also track sleep with metrics displayed in the Fitbit app. The TomTom Cardio Multisport hit a runtime of 8 hours of GPS in our testing, and is swim proof. Once you've paired your Forerunner 225 with your smartphone, you can use the Live Tracking feature to instantly share details of your run, in real time with friends and family anywhere in the world. There's sleep tracking on board and it's water resistant up to 50m. In our tests we didn't quite make it to the full 10 hours of battery life Garmin promises, we got closer to 7. It's important at this point to mention the prices of this running watch trio. The Forerunner 225 costs $299.99, the most expensive of the bunch, with the Surge and the TomTom both costing $249.99. So there's not much in it. Our advice – if you are counting the pennies, go for the TomTom. If, however, you can stretch to the 225's RRP that should be the running watch you go for. The Surge is no dud, by any stretch, and is probably the easiest to use for everyday fitness tracking but, if you're serious about bpm-based GPS running, the Mio sensor in the Multisport and the Forerunner put them streets ahead.